Easy Canadian Chocolate Bars Recipe - Some people ask about chocolate making way, then here we are sharing some collected recipes. 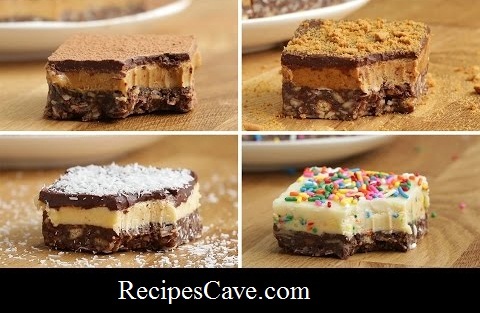 You will get four recipe of easy chocolate bar. Follow all the steps and start cooking. In a bain-marie, melt the butter, sugar, and cocoa powder. Stir in the egg and keep stirring for a minute until the mix thickens. Add the graham cracker crumbs, the almonds (chopped finely), and the coconut flakes. When well mixed, pour into an 8 x 8-inch pan and flatten until you get an even layer. Cream the custard powder, softened butter, cream, and instant coffee until smooth. Pour mixture on top of the crust and spread it until you get an even layer. In a bain marie, slowly melt the chocolate and the butter. Cool it down a little bit then pour over middle layer. Cut them into 9 even squares and sprinkle each one with cocoa powder. Cream the custard powder, softened butter, cinnamon, ginger, cloves, nutmeg, and cream together until smooth. Cut them into 9 even squares and sprinkle each one with coarse gingersnap crumbs. Cream the custard powder, softened butter, and coconut milk until smooth. Add the powdered sugar and the shredded coconut and mix until smooth. Pour the mixture on top of the crust and spread it until you get an even layer.